Today's Draw: The Hanged Man from the Touchstone Tarot. Are you currently trying to exert influence over a situation you just can't change? Have you even assessed whether or not it's within your control or are you just acting unconsciously? What aspects of the situation ARE you in control of? You don't have to be in a 12-step program to understand the wisdom of those words. How often do we continue to flail our will against people and situations it's not in our power to change? Meanwhile things we can change are left to go to weed. I've never been in a 12-step program, but I imagine there are many nuances to accepting the things you cannot change. You can't change others. You can't change many situations in your life. And you also can't change the damage you have done and choices you have made in the past. But there's usually stuff you can change that's related to the stuff you can't. You may not be able to take back words you said in anger, but you can change the way you respond in the face of anger from this moment forward and, in doing so, if the other person is willing, regain the trust you lost. Another thing I found interesting about this card is that it looks like Jesus, but it's not. 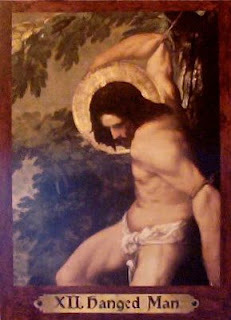 It's Saint Sebastian, who was martyred for his beliefs. He's the Saint that protects us from the bubonic plague. With some notable exceptions in the 14th-18th century, including one that killed nearly 1/3 of the earth's population (oops!) he's done a pretty good job. People still get it, but Alexander Fleming, the patron mortal of penicillin, pretty much managed to wipe it out. That's a man who had the wisdom to know what he could change. Anyway, for those following on my blog at http://thedailytarotdraw.blogspot.com/, you can get a hint into the process of what might be called a collage deck. This particular card is made up of elements of four different paintings. I've posted the main painting on my blog. The tree, halo and garden in the background have all replaced elements in the original. She also removed all the arrows from Saint Sebastian's body. So the artist, Kat Black, also has the wisdom to change the things she can. 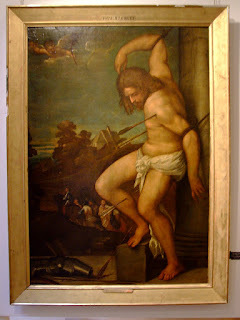 So I've hopped all over the place in this entry...surrender, the Serenity Prayer, Saint Sebastian (not Jesus), the bubonic plague and tarot art. In an effort to tie it all together, I'd say that there's always more to things than what appears on the surface. Few things are as cut and dried as they appear. Which goes back to the Hanged Man's way of looking at things from a different perspective. If you're finding yourself occupied by focusing on the things you can't change right now, why not look, instead, for the parts of the situation you can and start there?